From Beast Kingdom. A PREVIEWS Exclusive! An unprecedented cinematic journey ten years in the making and spanning the entire Marvel Cinematic Universe, Marvel's Avengers: Infinity War brings to the screen the ultimate, deadliest showdown of all time. Beast Kingdom has paired up with Marvel and Diamond Comic Distributors to offer fans a line of figures inspired by the new film! Thanos, the mad Titan, seeks to gather the Infinity Gems and harness infinite power. 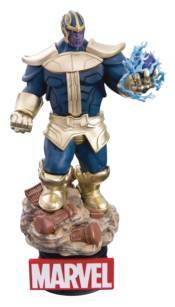 This 6' tall statue depicts Josh Brolin as Thanos from the film! DISNEY STEAMBOAT WILLIE 4" METALS DUMBO DUMBO & TIMOTHY VYNL. JACK SKELLINGTON DISNEY 2.5" METALS WAVE 02 KINGDOM HEARTS MINIMATES SERIES 3 ASST.